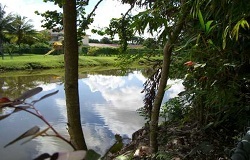 Waterfront homes in South Miami are on canals or small lakes and do not have ocean access. While some of the canals and lakes allow for canoes and paddle boats, the biggest appeal to waterfront homes in South Miami is the serene nature and added privacy they provide. While most buyers do not specifically seek out a waterfront home in South Miami, finding a great home on a canal or lake in South Miami is always a special bonus.